The scholarship in the volume Comparative Cultural Studies and Latin America represents the proposition that, given its vitality and excellence, Latin American literature deserves a more prominent place in comparative literature publications, curricula, and disciplinary discussions. 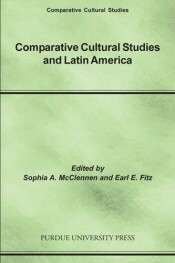 The editors of the volume argue that there still exists, in some quarters, a lingering bias against literature written in Spanish and Portuguese and that by embracing Latin American literature more enthusiastically, comparative literature in the context of comparative cultural studies would find itself reinvigorated, placed into productive discourse with a host of issues, languages, literatures, and cultures that have too long been paid scant attention in its purview. Following an introduction by the editors, the volume contains papers by Gene H. Bell-Villada on the question of canon, by Gordon Brotherston and Lúcia de Sá on the First Peoples of the Americas and their literature, by Elizabeth Coonrod Martínez on the Latin American novel of the 1920s, by Román de la Campa on Latin American Studies, by Earl E. Fitz on Spanish American and Brazilian literature, by Roberto González Echevarría on Latin American and comparative literature, by Sophia A. McClennen on comparative literature and Latin American Studies, by Alberto Moreiras on Borges, by Julio Ortega on the critical debate about Latin American cultural studies, by Christina Marie Tourino on Cuban Americas in New York City, by Mario J. Valdés on the comparative history of literary cultures in Latin America, and by Lois Parkinson Zamora on comparative literature and globalization. The volume also contains a bibliography of scholarship in comparative Latin American culture and literature and biographical abstracts of the contributors to the volume. Sophia A. McClennen studied philosophy as an undergraduate at Harvard University and received her Ph.D. in Spanish and Latin American Literature from Duke University. She works in comparative cultural studies with special emphasis on Latin America and has published on media culture, gender studies and cultural theory. She currently teaches in the Department of Comparative Literature and the Department of Spanish, Italian, and Portuguese at the Pennsylvania State University . McClennen's interests and publications are in comparative cultural studies and Latin America and she has published articles in journals such as Revista de estudios hispánicos (2002), The Review of Contemporary Fiction (2000), Cultural Logic (2000), Media-tions (1999), and CLCWeb: Comparative Literature and Culture (2000). Recent books include The Dialectics of Exile: Nation, Time, Language, and Space in Hispanic Literatures (Purdue UP, 2003) and Ariel Dorfman: An Aesthetics of Hope (Duke UP, 2003). Earl E. Fitz teaches Portuguese, Spanish, and comparative literature at Vanderbilt University where he is also director of Vanderbilt's Program in Comparative Literature. Fitz has published extensively on comparative approaches to the study of Latin America , including Rediscovering the New World: Inter American Literature in a Comparative Context (1991) and Ambiguity and Gender in the New Novel of Spanish America and Brazil (1993).